On Saturday,17th June, Harrow held its inaugural Speech Day. 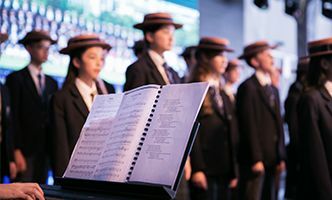 ‘Churchill Songs’ was a special event for everyone as we celebrated all we have achieved during our first year, both collectively and individually. Harrow’s greatest alumni, Winston Churchill, gave one of his best known speeches to the Harrow boys in October 1941, and, it is in honour of that famous occasion, that we have named our Speech Day, ‘Churchill Songs’. It was at that event that Churchill gave his stirring speech where he famously said: “Never give in. Never give in. Never, never, never, never – in nothing, great or small, large or petty – never give in, except to convictions of honour and good sense”. We were lucky to have a beautiful sunny day and the Parkyard Hotel and marquee proved the perfect venue. The pupils all looked immaculate in their boaters and blazers. The event kicked off with a performance from the Harrow Wind Band with the theme from ‘Wallace and Gromit’. They gave a very polished performance and it was hard to believe that many of the Prep and Senior pupils playing had never picked up a wind instrument before joining Harrow. 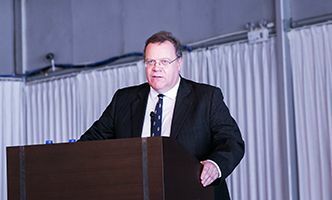 This was followed by a speech from the founding Head Master, Mr David Cook in which he highlighted the level of commitment this year from pupils and staff and just how far we had come in such a short time, followed by some ‘fun facts’ about life at Harrow Shanghai. Guests and pupils then enjoyed an iMovie showing major highlights from our first year which brought back many happy memories. This is now playing on the large TV screen in our lobby for anyone who wants to see it again. Reception and Year 1 and 2 pupils then performed ‘The Jungle Book’ classic, ‘I Wan’na Be Like You’ and the Head Master and special guest, Mike Gatting OBE, former England and Middlesex cricketer, then presented the Early Years and Pre-Prep Prizes. These were awarded in Literacy, Mathematics, Mandarin and Endeavour. Years 3 and 5 followed with a rousing rendition of ‘Chocolate Molinillo’, playing their recorders as well as singing. The Sports Prizes were announced next, which included Most Improved Player and Player of the Year awards for netball, football and volleyball, along with Victrix/Victor Ludorum awards for Sports Day, the presentation of the Lowe Mile Cup and the announcement of Sportsman and Sportswoman of the Year. 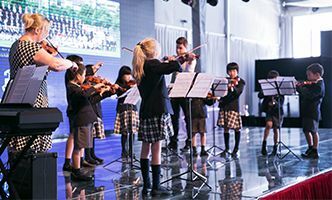 The Harrow Violin Ensemble took centre stage next, performing two pieces, ‘Goldfish Bowl’ and ‘Mattachins’. The Prep and Senior prize winners were then announced including the Barnaby Lenon and Jim Hawkins prizes, named after the current and preceding Head Master of Harrow UK. 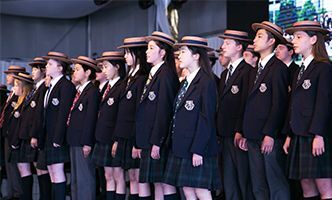 The Prep and Senior School Choir then sang a selection of Harrow School songs, all still sung today by students at Harrow UK. Proceedings concluded with an insightful speech from Mike Gatting on the importance of sport in shaping students and their futures. All the Harrow pupils, staff and parents then stood to sing the official Harrow school song, ‘Forty Years On’. Everyone had worked up quite an appetite by then and afternoon tea was served on the lawn outside. 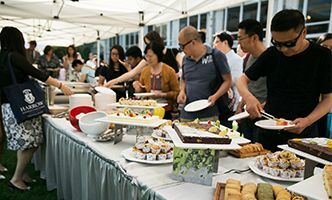 Guests were impressed by the quality and quantity of the food, which included a quintessentially English sandwich selection, scones with clotted cream and strawberry jam and cups of English tea.